As comfortable and easy as flip flops are to wear, remember most do not support your feet properly. Wearing flip flops often changes your gait or causes the feet to over-pronate (roll in). The result is arch pain, foot pain from strained muscles and tendons, ankle sprains and lower back or hip pain. 1. Start by looking for support. Choose sandals and flip-flops with orthotic-like arch support, as well as an indented heel cup to hold the heel in place and reduce instability when the heel strikes the ground. Don't make the most common mistake by going for the flat soled option. For the sole, look for quality materials, this means forgiving yet firm materials, such as rubbers or soft plastics. 2. Do not buy cheap foam material that is too flimsy and lacks a solid form. A good general rule is to try to bend the sole along its length. It should bend only slightly, and if it can almost touch the heel to the toe, you're definitely looking at the wrong material. 3. Pay careful attention to straps, as well. Consider leather or soft materials to reduce irritation and blisters. Avoid plastic or cotton straps, or any that are too thin and can cut into the skin. 4. Wear your sandals and flip-flops in moderation. This means avoid them during all-day events, athletic activities, and especially during yard work. Even if you follow my guide and buy the very best flip-flops, they are still less suited than sneakers for these activities. 5. 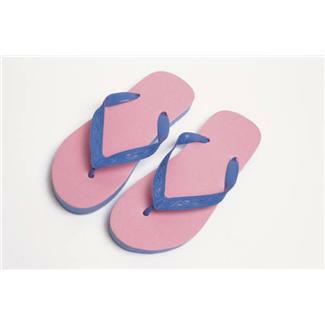 Most importantly, replace your flip flops or sandals before they begin to show signs of moderate wear. Once your shoes show wear, especially the heels and midsole, they begin to lose their shock absorption. Failure to replace worn shoes is a common cause of injuries like shin splints, heel spurs and plantar fascitis. If you have additional questions about determining the right sandal or shoe for you, ask Dr. Rulli at your next visit.